The principal pilot trainer used during World War II was the Link Trainer. Some 10,000 were produced to train 500,000 new pilots from allied nations, many in the USA and Canada because many pilots were trained in those countries before returning to Europe or the Pacific to fly combat missions. Almost all US Army Air Force pilots were trained in a Link Trainer. Statistically significant assessments of skill transfer based on training on a simulator and leading to handling an actual aircraft are difficult to make, particularly where motion cues are concerned. Large samples of pilot opinion are required and many subjective opinions tend to be aired, particularly by pilots not used to making objective assessments and responding to a structured test schedule. For many years, it was believed that 6 DOF motion-based simulation gave the pilot closer fidelity to flight control operations and aircraft responses to control inputs and external forces and gave a better training outcome for students than non-motion-based simulation. This is described as "handling fidelity", which can be assessed by test flight standards such as the numerical Cooper-Harper rating scale for handling qualities. Recent scientific studies have shown that the use of technology such as vibration or dynamic seats within flight simulators can be equally as effective in the delivery of training as large and expensive 6-DOF FFS devices. When a manufacturer wishes to have an ATD model approved, a document that contains the specifications for the model line and that proves compliance with the appropriate regulations is submitted to the FAA. Once this document, called a Qualification Approval Guide (QAG), has been approved, all future devices conforming to the QAG are automatically approved and individual evaluation is neither required nor available. 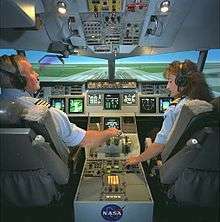 The largest flight simulator in the world is the Vertical Motion Simulator (VMS) at NASA Ames Research Center in "Silicon Valley" south of San Francisco. This has a very large-throw motion system with 60 feet (+/- 30 ft) of vertical movement (heave). The heave system supports a horizontal beam on which are mounted 40 ft rails, allowing lateral movement of a simulator cab of +/- 20 feet. A conventional 6-degree of freedom hexapod platform is mounted on the 40 ft beam, and an interchangeable cabin is mounted on the platform. This design permits quick switching of different aircraft cabins. Simulations have ranged from blimps, commercial and military aircraft to the Space Shuttle. In the case of the Space Shuttle, the large Vertical Motion Simulator was used to investigate a longitudinal pilot-induced oscillation (PIO) that occurred on an early Shuttle flight just before landing. After identification of the problem on the VMS, it was used to try different longitudinal control algorithms and recommend the best for use in the Shuttle program. ↑ Federal Aviation Administration (25 April 2013). "FAR 121 Subpart N—Training Program". Retrieved 28 April 2013. ↑ "Dry Shooting for Airplane Gunners." Popular Science Monthly, January 1919, pp. 13–14. ↑ Fly Away Simulation (12 July 2010). "Flight Simulator Technology Through the Years". Archived from the original on 12 October 2011. Retrieved 20 April 2011. 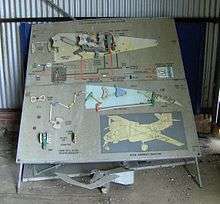 1 2 3 4 "ASME Landmarks: The Link Flight Trainer." American Society of Mechanical Engineers. Retrieved: 18 December 2011. ↑ "U.S. Air Force Fact Sheet: Link Trainer." National Museum of the United States Air Force. Retrieved: 12 October 2016. ↑ "Airline Pilots Fly Anywhere in the world - Without Leaving the Ground." Popular Mechanics, August 1954, p. 87. ↑ "Navy CPT". www.navair.navy.mil. U.S. Navy. Retrieved 4 August 2014. ↑ Andrea L. Sparko; Judith Bürki-Cohen; Tiauw H. Go (2010). Transfer of Training from a Full-Flight Simulator vs. a High Level Flight Training Device with a Dynamic Seat (PDF). AIAA Modeling and Simulation Technologies Conference. doi:10.2514/6.2010-8218. Retrieved September 18, 2016. ↑ Peter John Davison. "A summary of studies conducted on the effect of motion in flight simulator pilot training" (PDF). MPL Simulator Solutions. Retrieved September 18, 2016. ↑ Beard, Steven; et al. "Space Shuttle Landing and Rollout Training at the Vertical Motion Simulator" (PDF). AIAA. Retrieved 5 February 2014. ↑ "DESDEMONA: The next generation in movement simulation" Nederlandse Organisatie voor Toegepast Natuurwetenschappelijk Onderzoek Retrieved: 5 July 2012. ↑ Roza, M., M. Wentink and Ph. Feenstra. "Performance Testing of the Desdemona Motion System." AIAA MST, Hilton Head, South Carolina, 20–23 August 2007.